Looking to plan the perfect business dinner party? Be sure to read this blog first! It’s important to select a date and time that works both for your schedule and that of your guests. The length of the dinner should also be taken into consideration, as you don’t want to rush your guests and allot enough time for toasts, speeches, or presentations is need be. 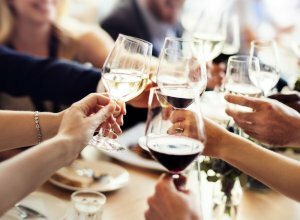 Forbes Magazine suggests 2-3 hours for the average dinner party. When creating the guest list, don’t forget that colleagues and clients may bring their significant others. Be sure to account for them when designing a seating chart, too. Invitations should be sent to guests 1-2 weeks before the event. Be sure to include date, time, directions to the venue, and how to RSVP in the invitation. You can also provide a way for guests to make special food requests based on dietary restrictions, such as allergies or vegetarianism. For larger dinner parties, it may be advantageous to host at a restaurant or other venue to cut down on the cost and time of preparation, cooking, decorating, and cleaning up. Be sure to visit the venue ahead of time to ensure that it meets your needs. You can request a specific table or section of the venue to secure the ideal ambience for your event. Reserving the space or seats ahead of time critical! For the perfect evening, work with the restaurant in advance to plan a menu and pair a selection of wines with the meal so that the wait staff are well prepared.Many restaurants can provide customized printed menus to be placed at each seat. Be sure to arrive at least 30-45 minutes early for the dinner party to check the set up and deal with any last minute details. Set place cards and menus at the table for each guest. Think carefully about who to position at the head of the table, be it yourself of a guest of honor. Greet your guests when they arrive, encourage mingling, and enjoy! Does it sound like a lot of work? It is. Successful Affairs has been helping clients in and around New York plan perfect business dinner parties, weddings, Bar Mitzvahs, Bat Mitzvahs and much more. We can help you do the same! Don’t waste hours surfing the web and making calls. We are experts in negotiation and decades’ worth of connections that we can leverage to get you a great deal and a successful affair. Contact us for more details!